Following my mood for trying something new these days and avoid reverting to my ‘good ol’ habbits’ I spent Easter in Paros for the first time. For the first time, that is, in Greece away from Corfu. Anyone that knows me well understands that this is quite a strange thing to do, since I could easily be called a Corfiot Easter ‘fanatic’. 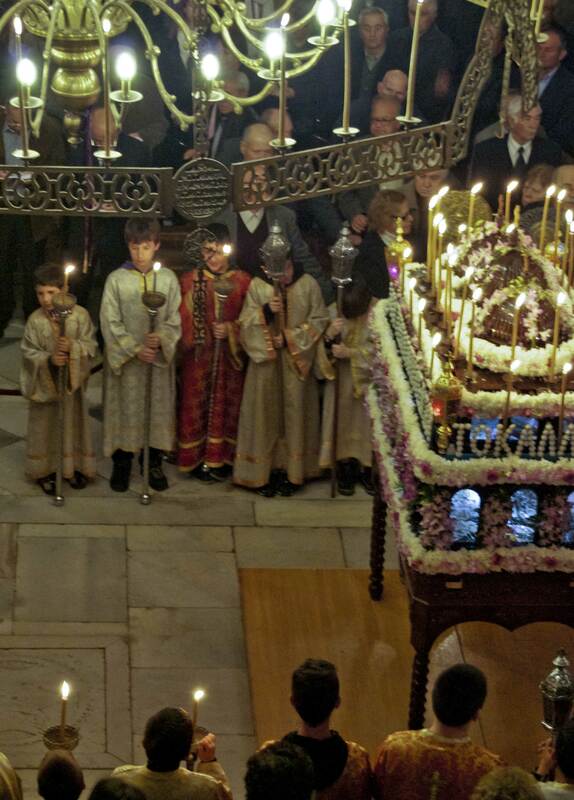 Of course I missed home and how we do Easter there, but I was equally curious and excited to experience a more “Orthodox” Easter that is celebrated in the place I now live. With Easter week over but the Easter feel still in the air, I can say that in both places – Corfu & Paros – it is a beautiful coming together of the community to remember its heritage and celebrate life. It is a festivity that feasts in spring to spread an ethereal optimism. At Paros I went to watch the main easter do’s at the Ekatontapiliani Church in Parikia (a literal translation in English would be: the Church of a Hundred Doors), a breathtaking monument. The site was originally an ancient temple and a roman gymnasium. In the 4th century AD the Byzantine Emperor Constantine built in its place this Christian church following his mother’s (St. Helen) will. A couple of centuries later, Emperor Justinian restored and enlarged the original structure. It has been operating as a Christian church ever since, that is for a bit more than 1700 years. The architectural style is pure and original byzantine and most of its building materials are a re-use of the ancient pieces of parian marble found on site. In other words, you can read great parts of the history of Paros and of the eastern mediterranean just by sitting there. So, although my ‘default’ enjoyment of Easter celebrations is heavily, if not exclusively, based on the music and spring colors of Corfu, this too was a beautiful yet very different experience. Easter on Paros is a more obvious religious event than I would fancy these festivities to be and visiting the church during the various easter services didn’t make of me a bearer of hope and light in any religious or dogmatic sense. But I was moved and excited these days by the overall community feel, the beauty of the Ekatontalypiani, the naturalness in everybody’s behaviour in engaging with the rituals, the blossoming of the island, the brightness of the Aegean light and the force of its winds; a combination of elements that created a very specific environment for friends to meet. So I may not have felt any sort of metaphysical transcendence, but I was definitely reminded that symbols and rituals make it easier for us to mark and live the extraordinary.